Acre Estate with Pool and Jacuzzi. Property 1: Acre Estate with Pool and Jacuzzi. 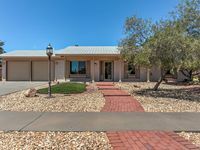 Swimming Pool: Memorable El Paso Getaway: 4 Bedroom, close to Airport, Ft Bliss. 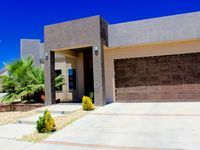 Property 4: Swimming Pool: Memorable El Paso Getaway: 4 Bedroom, close to Airport, Ft Bliss. Large 4-BR House in a Nice Neighborhood! Property 9: Large 4-BR House in a Nice Neighborhood! East El Paso Remodeled Beautiful Home with Patio! Property 11: East El Paso Remodeled Beautiful Home with Patio! Very nice place, East side of El Paso. Easy access to highways and great little neighborhood. Loved the Vista Market and Steve O's! Super comfortable for four. Advertised as sleeping 7(!). I don't recommend for more than four guests unless owner springs for some additional bedding. We are a family of five so one of the girls slept on the futon, but there was no bed pad or blankets for it so sheets slid around and you could feel seams through sheets.. A prior guest had same complaint about the lack of blankets so thought maybe it had been fixed, but had not. Also &quot;hot tub&quot; is jacuzzi bathtub. Other than that nice stay.